Laffy Taffy in assorted flavors. 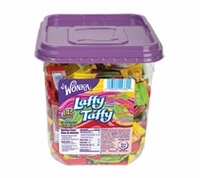 Chewy taffy with a great flavor by Wonka. Each jar has an assortment of 4 flavors. Banana, Cherry, Strawberry and Apple. With a goofy joke on every wrapper.